Fuel: A new thrilling film about why need to kick our addiction to oil and how we can get to a green energy future. February 12, 2009, 2:10 p.m. The last half hour of Fuel reconciles these two sides somewhat, cluing in the biodiesel newbies on the fuel’s dark sides, while assuaging the biodiesel critics that their concerns are indeed valid concerns — before proposing a more complicated future of green fuel. 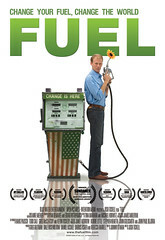 Fuel traces the story of one Josh Tickell, a grease-lovin’ dude who spent an idyllic childhood in Australia, moved to oil industry-polluted Louisiana where many people had health problems (his mother suffered 9 miscarriages), discovered biodiesel in Germany, then basically became a techie hippie of sorts — traveling around in a biodiesel ride to educate the public on the power of grease. Watch Fuel, and you’ll get a quick lesson on all the problems posed by America’s addiction to oil: Huge oil spills as a result of Katrina, general environmental pollution, health problems, etc. You’ll also get a quick primer on how the government’s encouraged this addiction, with big subsidies for big cars, even bigger subsidies for oil companies — and a willingness to wage huge wars to get oil. And during the bigger part of the film, Fuel pushes biodiesel as the obvious, easy, and quick solution to all these oil-related problems. Josh pretty much deifies Rudolf Diesel, pointing out that his engine was originally designed to run on peanut oil, taking the power away from big oil and giving it back to small farmers. Of course, biodiesel’s not without its own problems — which Fuel finally gets to in the last half hour of the film. When it does though, Fuel clearly outlines the many concerns: genetically-modified crops, monoculture farms, razed rainforests, etc. Read Tom Philpott’s post from yesterday, “Don’t suffer biofuels gladly,” for a quick look at why many environmental groups oppose government subsidies as they’re currently awarded for biofuels. In fact, Fuel ends up reporting that biodiesel’s really only a small part of our green fuel / energy future. And despite the fact that most of the film seems to push readily-available biodiesel as the immediate eco-fuel solution we can use now, Fuel in the end showcases the most environmentally viable biofuels as algae-based biodiesel and cellulose ethanol — fuels that aren’t even commercially available or viable yet. That last half hour, in fact, packs in a whole lot, expanding the biodiesel-is-the-solution mantra and complicating it, to include wind, solar, public transportation, energy efficiency, and other alt fuel sources (some still just experimental). For a film that seems to start out pushing an instantaneous solution to our oil problem, the conclusion of Fuel’s much less simple and immediate. There is, in fact, no instant solution — though there are a rainbow of partial solutions that could, if cobbled together, give us a clean energy future. While I do think that the biodiesel-rah-rah part of Fuel could’ve been whittled down, I loved how the film quickly explained in easily understandable terms both the promises and challenges posed by the many alternative energy options that are currently under debate. Plus, fans of Sheryl Crow, Julia Roberts, Naomi Klein, Barbara Boxer, Woody Harrelson, Neil Young, Willie Nelson, Larry David, Larry Hagman, or Bart Reed will love seeing their celebrity in action. Fuel opens in L.A. tomorrow in two theaters -- and will be making its way to Bainbridge Island and Bellingham, WA; Kihei , HI; and New York City in the coming weeks. Keep tabs on Fuel's calendar to find out when it'll be in a theater near you.